Mephistophiles is the name of the devil in the Faust myths of the late Middle Ages through the Renaissance. During this period, there was a revival in the popularity of the Devil with the Protestant Reformation, which emphasized the Bible as the sole authority on religious matters, and thus greater emphasis on the New Testament concept of evil. Labels were thrown around between the Protestants and the Catholics – both claiming the other was the tool of the Devil, with Protestants claiming the Pope was the Antichrist. Rumors of Witchcraft and Satanism ran wild. New beliefs came to light during this time contributing to this phenomenon, stressing the importance of the individual’s choice of free will in following God or the Devil over previous notions of the cosmic battle between God and the Devil. God would still be there to protect the individual, but if the individual was weak in faith, it was seen as an open invitation to the Devil. Martin Luther struggled with the concept of the Devil and evil in relation to an omnipotent God, coming close to arguing that the Devil was just a manifestation of the evil side of God (as Christ was the good side of God). He wrote that God’s will included the Devil as his tool doing God’s work, and that he would not exist if God had not created him. However, while the two may appear to be doing the same will, their purpose is always different, with God always working towards the ultimate good while the Devil’s intent was to destroy. While the theology of the individual’s struggle between good and evil was circling, the poets and playwrights of the sixteenth and seventeenth centuries took to applying the classic narratives such as the Iliad to Christian mythos, and openly embraced the cosmic battle between Christ or Michael over the Devil and his fallen angels at the beginning of the world, a concept that was common to popular belief though not expressly written within the Bible itself. 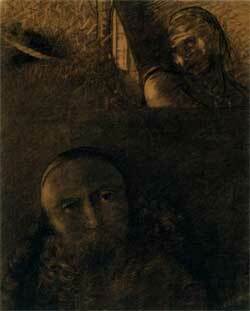 Much of it was based on Jewish Midrash of the fall of the Watchers or an interpretation of Revelation 12. And then came Faust. Faust was a historical figure who was turned into a legendary character throughout the years. The earliest accounts of his life come from the beginnings of the 1500s. Faust studied philosophy and theology, went on to hermetic magic and eventually ended up with fortune telling. With the theology of the Protestant Reformation circling, many identified hermetic magic, or any magic for that matter, as a prideful attempt at attaining divine knowledge through the intellect and thus must be aided by the Devil. 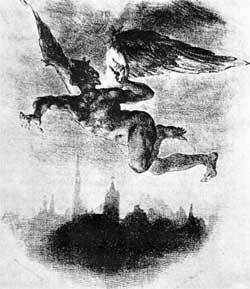 Faust soon became associated with the Devil, and by the end of the 1500s, rumors were spreading that he had made a pact with the Devil. The first book devoted entirely to Faust was written by Johann Spiess in 1587 and came to be known as the Faustbook. Faust, a scholar, desires to obtain knowledge and thus sells his soul to the Devil – a parallel to the original sin of Adam and Eve and their quest for the forbidden fruit of the tree of knowledge. The spirit Faust invokes as a servant of Lucifer is Mephistophiles, who agrees to aid Faust in this quest for twenty-four years if Faust will make a pact written in blood to deny Christ and the Christian people. When his time is up, Faust experiences a moment of piety and summons his students and warns them against sin and temptation. His actions are in vain, though, for the next morning, his mangled body is found. Another famous account of the Faust myth was written by Christopher Marlowe in 1588-89 called Doctor Faustus. The structure follows the Faustbook closely though Faust is portrayed in a clownish way, with Faust’s sin being pride and the moral of the story proclaiming that lust for worldly fame and power ultimately leads to destruction. Again, Faust’s mutilated body is found by his students the morning after his years of power have ended. Johann Wolfgang von Goethe transformed the Faust myth significantly when he wrote his version of Faust during most of his life (approx 1770-1832). Mephistophiles in this account is portrayed anywhere from a minor demon to the Devil’s equivalent (or even the Devil himself) appearing both as God’s opponent and the instrument of God’s divine will. Mephistophiles is presented as the spirit of chaos, as a liar and trickster who can flatter and coax. He hates beauty and fails to grasp the power of love. He is proud and reenacts the part of the Satan in Job, making a bet with God to win over Faust’s soul and asking God for permission to put Faust to the test. Faust, himself, is eventually able to redeem himself through his never ceasing to strive and give himself over to sensual pleasure, and through his learning to love.